Chelsea keeper Petr Cech and defender John Terry trained on Tuesday ahead of Wednesday's Champions League semi-final second leg against Atletico Madrid. 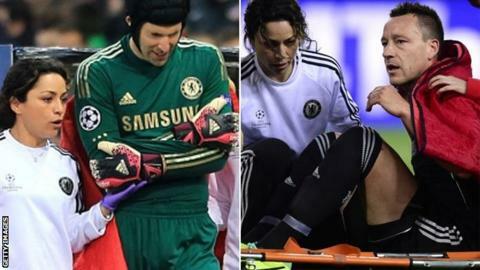 Cech's season was said to be over after he dislocated his shoulder in the first leg, while Terry injured his ankle in the 0-0 draw. Eden Hazard (calf) and Samuel Eto'o (knee) were also fit enough to train. Midfielders John Mikel Obi and Frank Lampard are suspended for the return leg at Stamford Bridge. They both received their second yellow cards of the knockout stages at Atletico's Vicente Calderon stadium. Blues coach Jose Mourinho said after the match in Spain that both Cech and Terry would miss the rest of the Premier League season, with the Portuguese stating that the defender would only feature again if his club reached the Champions League final on 24 May. Captain Terry, along with Hazard and Eto'o, who both missed the first game, trained with the squad, while Cech took part in a collective warm-up before having a personalised drill. When asked by Sky Sports News whether he was fit, the Czech keeper responded: "Of course." Australian keeper Mark Schwarzer, 41, came on in the 18th minute to replace Cech in Madrid and also played in the 2-0 win over Premier League title rivals Liverpool on Sunday. Atletico will be without suspended captain Gabi. Former Chelsea midfielder Tiago Mendes is expected to take his place.